Shout! Factory is currently putting the final touches to a Blu-Ray Collector’s Edition of John Water’s darkly humorous Serial Mom, scheduling it for release in May. If you are ill-mannered, have a poor sense of social etiquette or just plain irresponsible, then beware of the cheerfully psychotic housewife Beverly Sutphin. She will stop at nothing to rid of anyone failing to live up to her moral code! 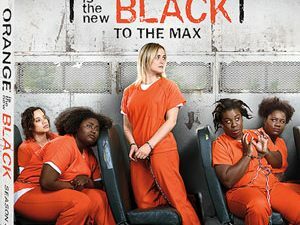 Starring Kathleen Turner as Beverly Sutphin, Sam Waterston and Ricki Lake, writer-director and pop culture icon John Waters puts a twist on the everyday mediocrity of suburban life in this outrageous dark comedy brimming with his unique brand of perverse humor and high camp. Aside from the movie itself, presented in a glorious new 1080p high definition transfer, the release will also contain a Conversation with director John Waters, actress Kathleen Turner and actress Mink Stole. 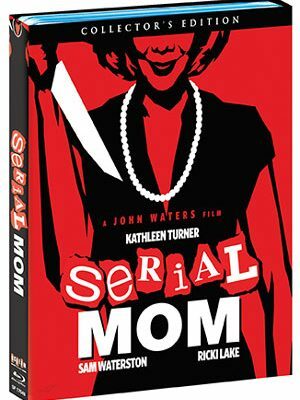 Also included are ”Serial Mom: Surreal Moments”, featuring interviews with Waters, Stole, Actress Patricia Hearst, actress Ricki Lake, actor Matthew Lillard, casting director Pat Moran, production designer Vincent Pirano & more! Naturally, the release also includes the previously released Feature Commentary with John Waters and Kathleen Turner, and the Feature Commentary with John Waters. The original promo featurette ”The Making Of Serial Mom” is also included, as well as ”The Kings Of Gore: Herschel Gordon Lewis and David Friedman” and the Original Theatrical Trailer. 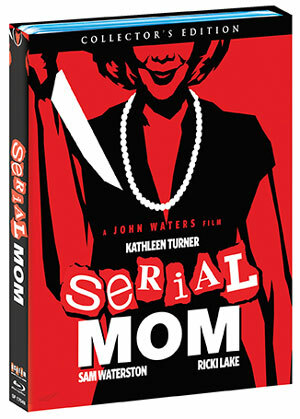 Serial Mom arrives on May 9 for $34.98 with a collectible cover art featuring newly rendered artwork approved by John Waters and a reversible cover wrap featuring original theatrical key art.